After posting the article yesterday on HMS Rattlesnake, HMS Samarang and Port Hamilton I received a comment on my facebook page from Alan (Kaptain Kobold) who is now a Pommie loose in Oz. Alan used to work at QinetiQ in Farnborough, England. 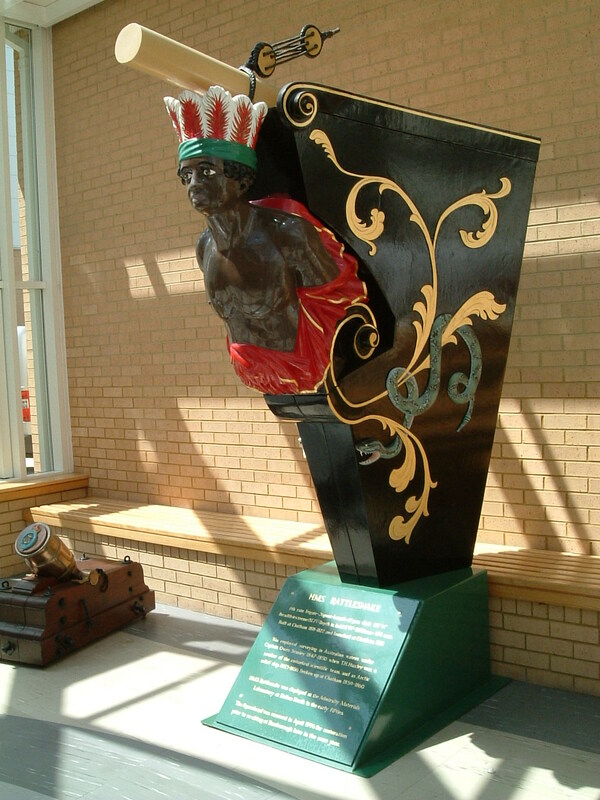 QinetiQ has the figurehead from Rattlesnake in the walkway leading to the canteen in the office. There are some other photos of the figurehead at Kaptain Kobold’s photo stream on flickr. 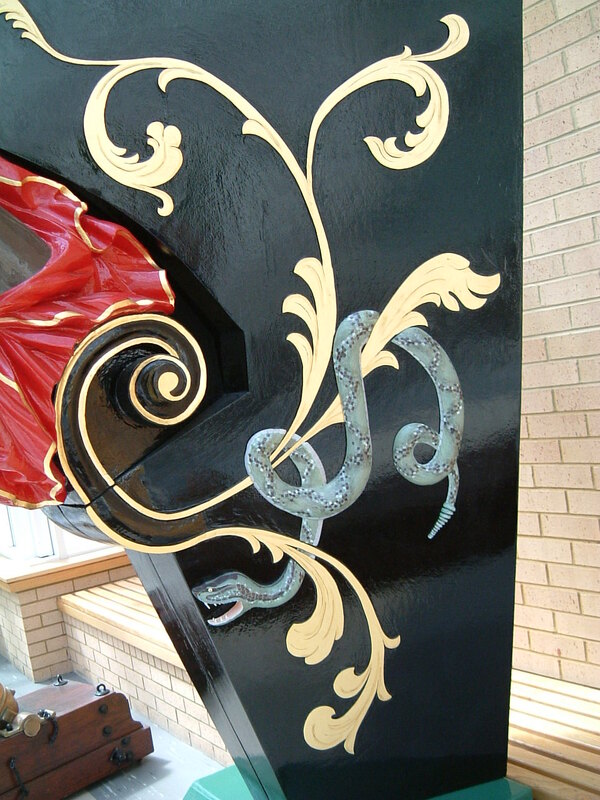 Also in the photo stream is a close-up of the rattlesnake on the figurehead. In some respects, it is a pity I model ships for wargaming in 1/1200th scale and smaller generally as the scale makes it too small to worry about some of the wonderful detail on old wooden ships. 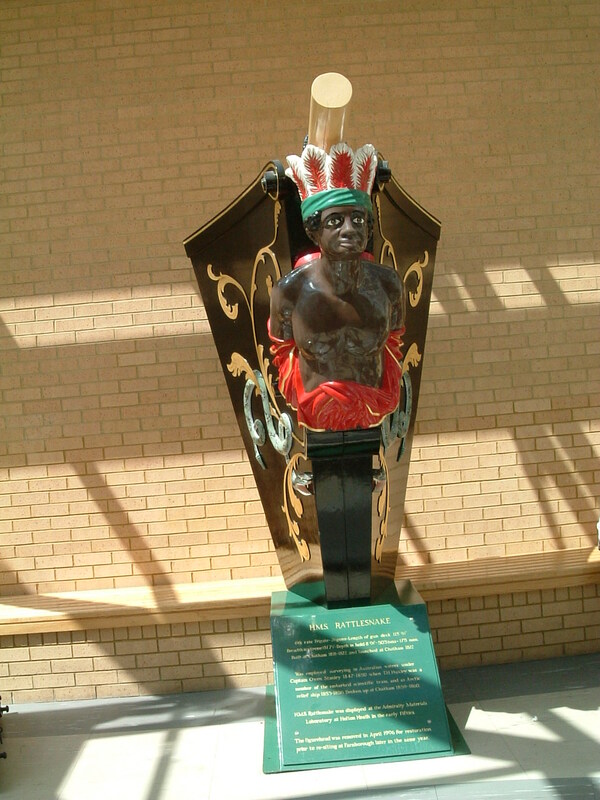 The figurehead was important to vessels built in the 16th to 19th centuries. The practice may have been inherited from the Vikings in earlier centuries with their carved dragon’s heads at the front of their longships although it has also been suggested that as with the stern ornamentation on these old wooden vessels, the purpose of the figurehead may have been to indicate the name of the ship in a non-literate society. Kaboutermannekes (or water fairies) were believed by some some European sailors (principally German, Belgian and Dutch) to live in the figurehead of a ship. The spirits were supposed to guard the ship from harm. However, if the ship sank, the Kaboutermannekes guided the sailors’ souls to the Land of the Dead. To sink without a Kaboutermanneke condemned the sailor’s soul to haunt the sea forever, so Dutch sailors believed. This is similar to early Viking beliefs. When the world moved forward to steel ram ships there was really no place for figureheads anymore. However, the practice seems to have been maintained in a different form in modern navies with a ships badge now being a unique identifier of a vessel. As an example, the badge to the left is from one of the Attack class patrol boats of the Royal Australian Navy. It is the badge of HMAS Bombard, one of the patrol boats stationed at HMAS Waterhen in Sydney. A number of the crew were friends of mine at the time so I knew this vessel quite well. She had a number of claims to fame. One was was her circumnavigation of Australia, celebrated with a somewhat ribald t-shirt, and completed on 7 September 1974 under commander, Lieut R. Cook, RAN. This was the first circumnavigation of Australia by a patrol boat. She was also used in the production of the 1979 ABC series, Patrol Boat ((the IMDB entry for Patrol Boat appears fairly mixed up between the various series as there is no mention of either Andrew McFarlane or Robert Coleby who played the two central characters of the first series)) where her pennant number, 99, was replaced with 83 for filming as she replaced HMAS Advance. After suffering an engine room fire near Point Perpendicular, an RAN Grumman Tracker from HMAS Albatross overflew the Bombard looking for her but saw pennant 83 on the bow so kept looking. I really should write up a short history of the Bombard, an interesting little boat. I will finish with another view of the figurehead from the Rattlesnake.